Perolo ATCO™ 1 1/2 ” MKI ball valves are designed for use on tank containers, road tankers, rail tank cars and static tanks to be used as an airline or for liquid transfer operation. Perolo ATCO™ 1 1/2 ” MKII ball valves are designed for use on tank containers,roadtankers, rail tank cars and static tanks to be used as an airline or for liquid transfer operation. Perolo ATCO™ 1 1/2 ” Flanged MKII ball valves are designed to allow loading and unloading in balanced system or pressurized inert gas, portable tanks or storage tanks, for chemicals and liquid food transported in tank containers, tank cars, road tankers and storage tanks. Perolo ATCO™ 1 1/2 ” Double Connection ball valves are designed to allow loading and unloading in balanced system or pressurized inert gas, portable tanks or storage tanks, for chemicals and liquid food transported in tank containers, tank cars, road tankers and storage tanks. Perolo ATCO™ 2" Flanged ball valves are designed for use on tank containers, road tankers, rail tank cars and static tanks to be used as an air line or for liquid transfer operation. Perolo ATCO™ 3" Flanged ball valves are designed for use on tank containers, road tankers, rail tank cars and static tanks to be used as an air line or for liquid transfer operation. Perolo ATCO™ 3" Flanged PN 16 EN 14333S ball valves are designed for use on tank containers, road tankers, rail tank cars and static tanks to be used as an air line or for liquid transfer operation. The Perolo ATCO 3'' - 2'' Ball Valve is designed to be installed on a 3'' flange to be used as an air inlet/outlet valve. 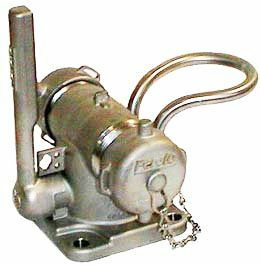 Made of 316L/1.4404 stainless steel, the Perolo ATCO 3'' - 2'' valve is applicable to tank containers, IBC's, rail tank cars and static tanks dedicated to transporting or storing chemical and food grade fluids. Stainless steel 2 piece BSP Ball valves are designed for use on tank containers, road tankers, rail tank cars and static tanks to be used as an airline or for liquid transfer operation. Other sizes or NPT thread available on request. Perolo Stainless Steel 3 Piece Full Port BSP Ball valves are designed fo use on tank containers, road tankers, rail tank cars and static tanks to be used as an airline or for liquid transfer operation.